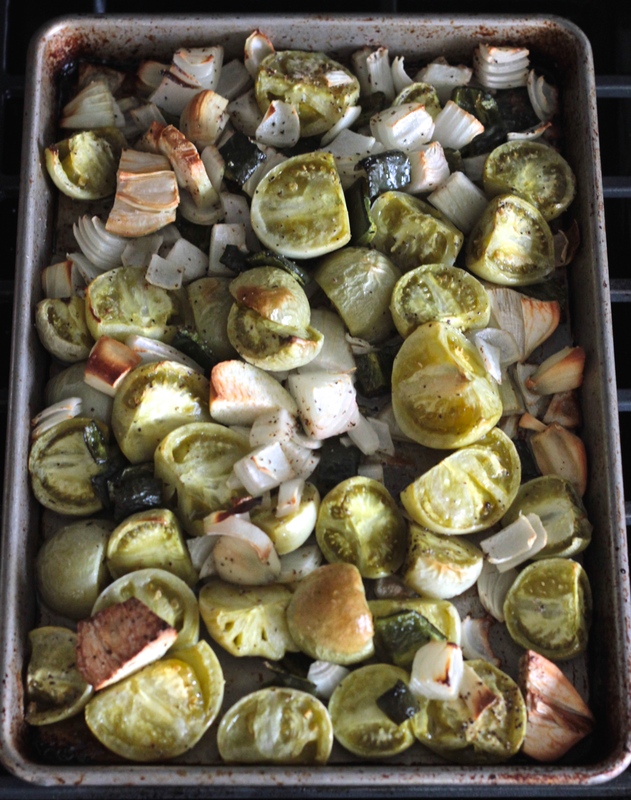 I love the lemony-limey tartness of tomatillos. We grew them in our garden a few years ago–I was so excited to have the little stalks growing the husked green balls I was planning on turning into my favorite green sauce. At the end of the season, though, I think I harvested enough tomatillos to make only 4-6 cups of sauce! Our tomato plants, though, they were producing like crazy. It was getting cooler outside and we still had so many tomato plants with pounds and pounds of green tomatoes. I thought, “Why not treat the green tomatoes like tomatillos?! They have the same tart flavor profile!” Thus was born my Faux Tomatillo Sauce–I never use tomatillos anymore, as long as I have a garden I have an abundance of green tomatoes! And I always make extra to freeze and enjoy all winter long! So easy to make–you just roast everything together in the oven, then add a few more ingredients in the blender, and voila, you have a green sauce ready for enchiladas, chips and dip, or quesadillas. 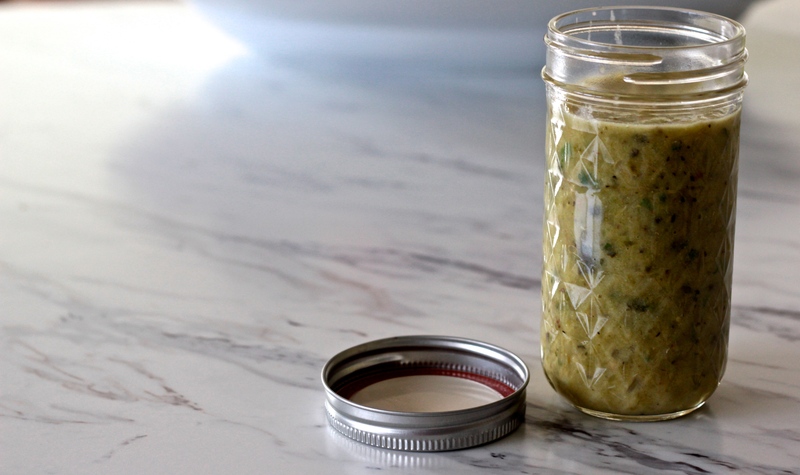 I even jarred this up for festive Christmas presents one year–green faux tomatillo sauce and red cranberry-orange syrup. You are going to look forward to having a ton of leftover green tomatoes from your garden! 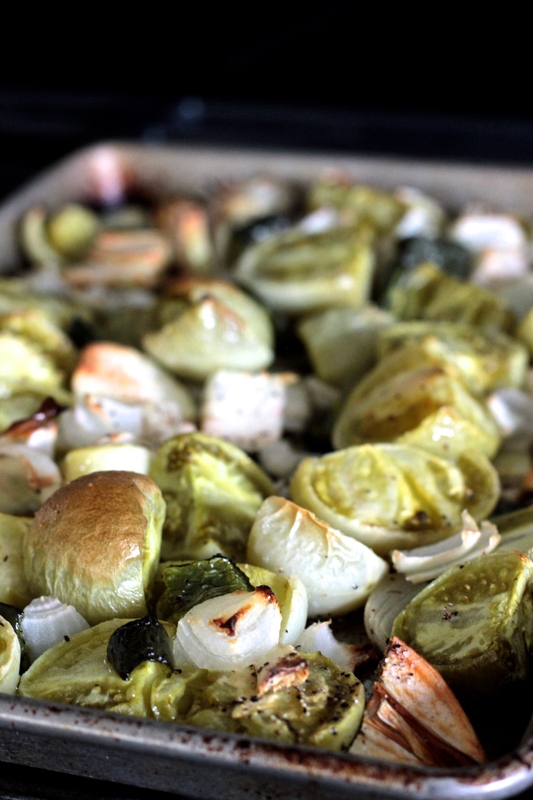 I love roasting vegetables to add an extra depth of flavor to sauces or soups. I usually make at least two batches at a time and freeze some to enjoy all winter long–one whiff of this freshly made sauce and your mouth will start watering for those Black Bean Sweet Potato Enchiladas! This would also make a really delicious fresh salsa if you wanted to blend all the ingredients raw. Preheat oven to 400 degrees. Place first group of ingredients (tomatoes through poblano pepper) in a large bowl, cover with olive oil (about 1/2 cup), salt and pepper. Pour into a shallow pan and roast in the oven for 45-60 minutes; keep an eye on things so they don’t burn–if the garlic cooks too quickly and burns, it’ll turn bitter. 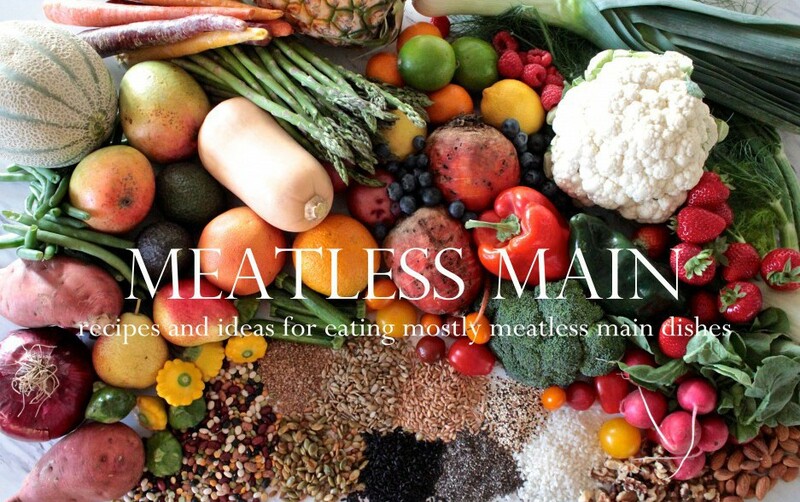 Pour roasted ingredients into a blender (BlendTecs are great because everything fits!) and add the second group of ingredients. Pulse until desired consistency–you can have it as smooth or as chunky as you like. Add more or less water to help your consistency. These pictures are amazing, and though I’ve never naked anything that so lovely and rustic, I think I should give this a try! I love tomatillo sauce as a base for yummy dressings.